With summer being around the corner , we all look forward to something exciting in our wardrobes…. something pretty or something bright colorful or something fun !! 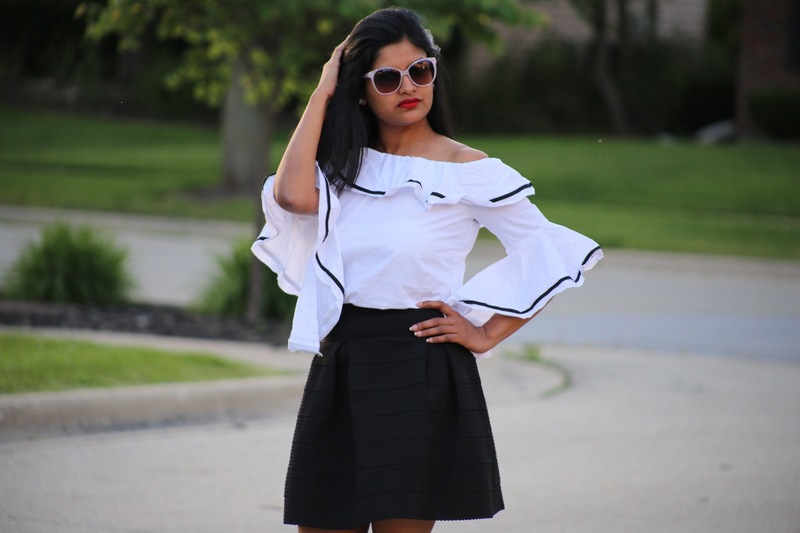 So , I collaborated with Romwe to Play dressup something fun …. yes !!! I am talking about Ruffles . If you ask me , Ruffles are no longer referred to current trend , I would say it is a must to have in the closet . So I chose white off shoulder + Ruffle with a black lining which gives a prettyness and cuteness to the top . This top can be absolutely paired with the skirts , denim and cotton pants as well . Romwe has always been my favorite to choose my favorite trends/favorite outfits according to the season . They have some exciting sales going on this summer , so hurry up ! Totally love this chic look. In love with these sleeves.